4 Bedrooms, 2 1/2 baths. Sleeps 10-12 people comfortably. Located in a gated Lake community on 8 acres with brook. Very private setting. Gorgeous log contemporary home offers 4 Bedrooms, 2.5 beautiful baths... master suite offers Jacuzzi tub! Gourmet kitchen with breakfast nook and very large dining area with table seating 10! Sliders to wraparound deck with picnic table... Great room with beautiful stone fireplace and plenty of comfy seating, loft area, mudroom with washer/ dryer and 2 car garage. High speed internet access in the home. Full basement with Pool table and Foosball. Firepit located on exterior. Extremely comfortable upscale classy country escape. Only 1 1/2 Hours away from the George Washington Bridge. Located 22 Miles (24 minutes) from Holiday Mountain Ski & Fun. Perfect for families with small children. Located 55 Miles (1 Hour) from Belleayre Mountain. Located 28 Miles (35 minutes) from Bethel Woods. **PLEASE NOTE: We have a MINIMUM renter age requirement of 25 years old! Weddings, prom parties are not allowed in community. Hand soaps supplied and towels. Shampoo and Conditioner not supplied. Located in Catskills, 1 ½ Hour Drive from NYC. Home is located across the street from a lake, it is a short 5 minute from home and not visible from the home. There is also a stream on property. Cordless phone located in Great Room as well as in Master bedroom. Yes there is central air in home. Forced hot air in home as well as heated floors located on the 1st floor of the home. Each bed is made up with blanket, pillow, sheets. Front Load washing machine. Soap supplied as well. Front loading large capacity dryer. Firewood supplied during winter months (Oct.-March). 2 Car Garage and plenty of on property parking. 2 car garage attached to home. Wifi is available at home. 12 -15 bath towels provided. Dishwashing tablets and soap supplied. 2 Door full size refrigerator with pull out freezer bottom. Gas oven with 6 burners. Home features K Cup machine, Drip coffee pot, and expresso pot. Coffee filters supplied and in home. Bring your own coffee! Salt, pepper, mustard, Misc. spices. Enough service for 12-14 people. Spectrum Service provided at home. Some located in Great Room. Monopoly, Cards, Scrabble. Misc. other items. Full scale professional pool table. There is a firepit on property...only accessible when there isn't snow. NO KAYAKS OR CANOES ON PROPERTY - RENTERS MUST BRING THEIR OWN. Can go kayaking and canoe on nearby lake. 1 Canoe and life vests supplied and in garage. Front Porch on home. No screens but great place to sit and enjoy a glass of wine or cup of coffee. Seating for 4 and round table on site. Beautiful Log Cabin in Catskills. We will rent for long weekends, weekly, monthly or seasonal. Located 22 Miles (24 minutes) from Holiday Mountain Ski & Fun. Perfect for families with small children, 55 Miles (1 Hour) from Belleayre Mountain and 28 Miles (36 minutes) from Bethel Woods Center for Arts and 60 Miles (1 Hour) from Woodbury Common Premium Outlets. Only a 1 1/2 hour drive from George Washington Bridge. For the last 10 years, we've joined 2 other families to see in the New Year and this home was ideal for that. The space was great and the ambiance with the large fireplace and windows to the woods was beautiful. We had an issue when we arrived with the heat but Angela was very responsive and someone was out shortly after. Just to keep in mind, upstairs there are two bedrooms but only one bath (located in master) whoever is staying in the room will need to use one of the other bathrooms. Not ideal but easy to work around. This was a gorgeous house!! We had a great Christmas because of you thank you so much! Thank you! Definitely a special place and photos do not do it justice. Glad you enjoyed your stay! Happy Holidays! 3 yrars ago, I rented this home for my 26th wedding anniversary and returned again this year for my 29th. This year it rained just about every day but that did not damper our vacation. Everyone still managed to get a daily hike in and we even swam and fished in the lake. The home is so open and spacious which made the stay so enjoyable, relaxing and a great place to just umwind from the every day stress. A beautiful home and truly a place to get away from it all. Highly recommend it. Good cabin, but the fake Police have to mind their own business. My friends and I had a blast at this cabin, extremely spacious, and cozy. However, if we tried to go to the nearby lake, we'd suddenly be swarmed by some self-made police persons thinking they own the complex. Here we are trying to relax, and they tell us things we could care less about. If the owner could forward this message to the fake cops in this complex area that they're nothing but annoying wannabee's that should invest their time into something more useful to society. This property is just amazing. It's a log mansion in the middle of no where. Great for a quiet get away. I can't think of one negative thing about this place. This house is amazing inside and out. The owner couldn’t be more accommodating. My family and I had a wonderfully relaxing weekend in this immaculate log cabin. Highly recommend! 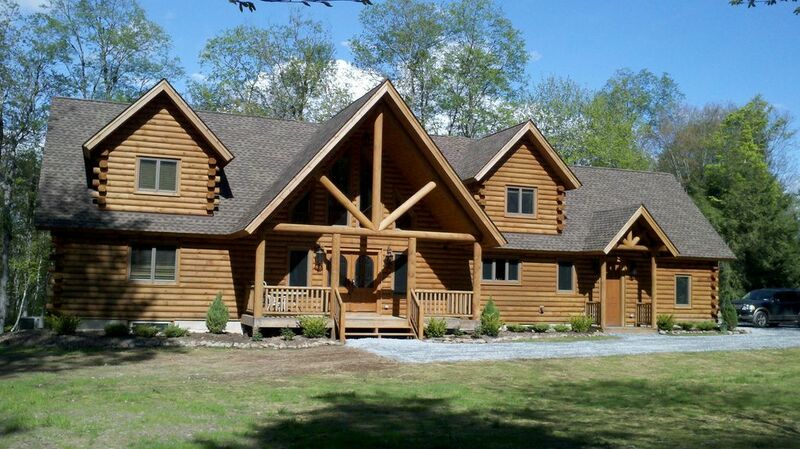 Log Home is located in “The Legends on Tanzman Lake" in Catskills. It is a small, gated waterfront community located in the heart of the Sullivan County Catskills. This is a perfect location – three minutes off Route 17 just outside Parksville, NY, Exit 98 on Route 17. The Legends is easily accessible from anywhere in the Northeast – Less than two hours from the George Washington Bridge. The property is surrounded by an amazing array of attractions and recreational activities for every season – golf, fishing, hiking, skiing and more, with an abundance of peace and serenity. Best of all, our community is just a “stone’s throw” from Bethel Woods Center for the Performing Arts, the hottest new performing arts venue in the East. Rates noted on site are for non holiday weekends. Christmas, New Years, Memorial Day, Labor Day, Fourth of July and Thanksgiving weekends are additional.